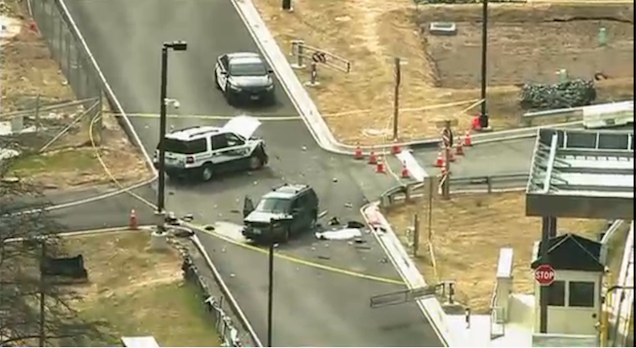 At least one person was killed and two were injured this morning after a driver reportedly attempted to ram the security gates outside of Fort Meade, the Army complex that houses the NSA's headquarters. Shots were reportedly fired during the attempted breach, though it's not immediately clear who fired them. Live local news coverage shows two damaged vehicles just inside the compound's gate. Fox DC reports that one person was killed and two others were injured. The car the two men were driving was reportedly stolen sometime Sunday night. UPDATE 11:22 am: CBS Baltimore reports that the drug found in the suspect's car was cocaine. The second suspect, according to the station, was taken to the University of Maryland Shock Trauma Center for treatment. A guard reportedly got into an altercation with two men disguised as women who were trying to enter the facility Monday morning, NBC News reports. Gunfire was exchanged, and it is believed that the guard shot one, or both, of the men. The condition of the men is not known at this time. A gun and drugs were found in the vehicle the men were riding in, according to NBC News.